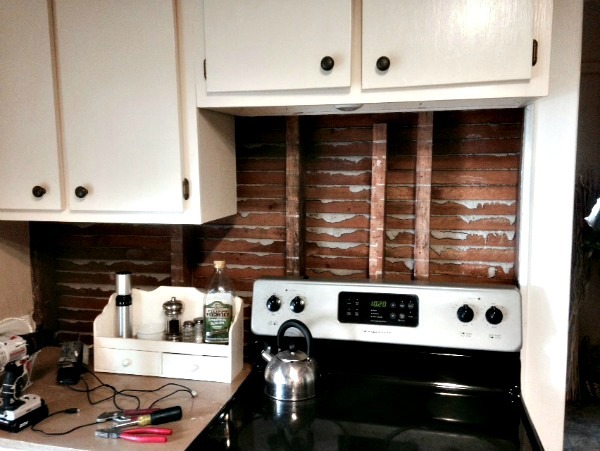 DIY Budget Kitchen Reno – The Big Reveal! The stress and mess is coming to an end….the #NeverEndingReno is finally (mostly) finished. Four months years in the making, the first leg of this renovation started in 2012, and we picked it up again in the fall of 2015. But first – BRACE YOURSELVES….this is where I started when I bought the house. These are the pics I took the first time I walked through – with my snazzy disposable camera. Holy dated country decor…..yes, it was the year 2000, but NO….it was not a stylish (or functional) kitchen even then. It was a lot better, but still pretty terrible. The room was dark and I only had a cramped little corner between the fridge and the sink for prep space. I sacrificed the pantry so that I could move the fridge, which improved the flow immediately. I added a base cabinet where the fridge had been for longer run of prep surface. I painted the cabinets a warm cream (a BEAST of a project, BTW), added molding to the tops, and built a shelf out of the old pantry shelves to get the microwave off the counter. I topped the fridge with a new set of small upper cabinets. Running the upper cabinets in a continuous “L” really helped make the kitchen appear bigger and less chopped up. I planned to add real butcher block counters, but…. I slapped a quick coat of paint over my old faux finish thinking it was a temporary fix. The project stalled and my two week fix ended up being a 3 year fix. I got busy, what can I say? 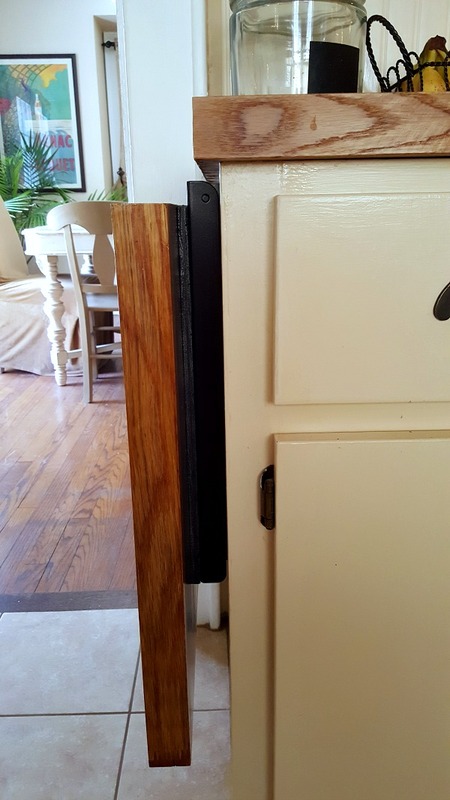 By 2015 it was fair to say the kitchen was a hot mess….the boards on the new flimsy cabinet weren’t even attached, the paint I slapped on in a hurry because I was having a party was chipping off all over the place. On Thanksgiving day 2015, without any real game plan, the renovation picked up again. After dinner and several glasses of wine, we got curious about what was behind the laminate on the wall behind the stove and started pulling it off. And then sh*t got serious. We decided to finally finish the renovation I started in 2012, and of course a lot of other projects were piled on top of my very modest original plans. I’m capable of a lot of DIY awesomeness, but having someone to help for the first time was a whole different ball game – especially since that someone has superior electrical and plumbing skills to mine. Not all the updates were pretty and exciting, but even these small changes and updates made for a much improved environment for the resident cook – me. 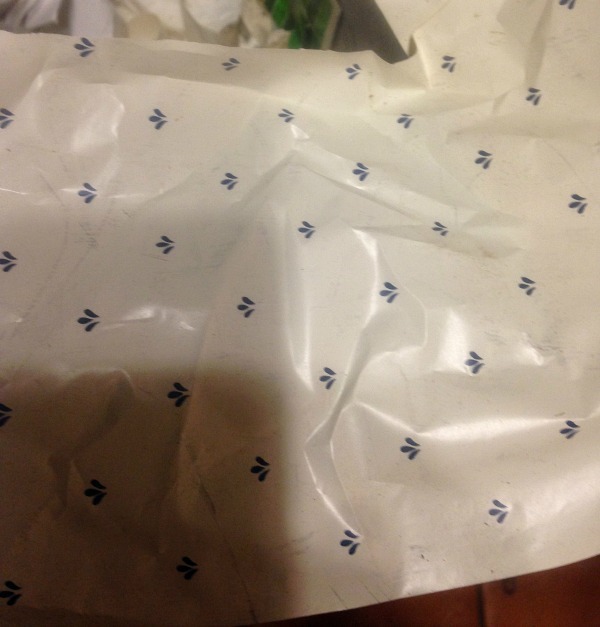 We finally ripped out the gross and dated contact paper from the lower cabinets, which is something I’ve been meaning to do since I bought the house. 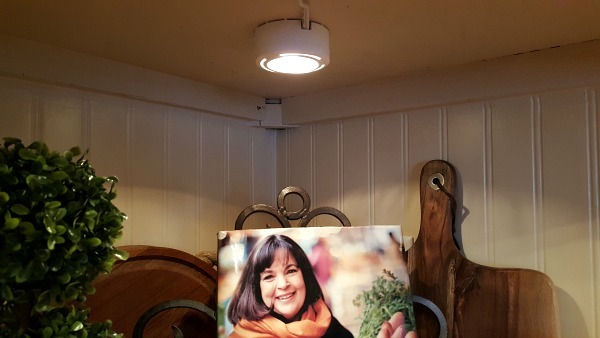 The electrical outlets were a mismatched mess, so we redid them and added lights under the cabinets – I can’t believe what a big difference they make! 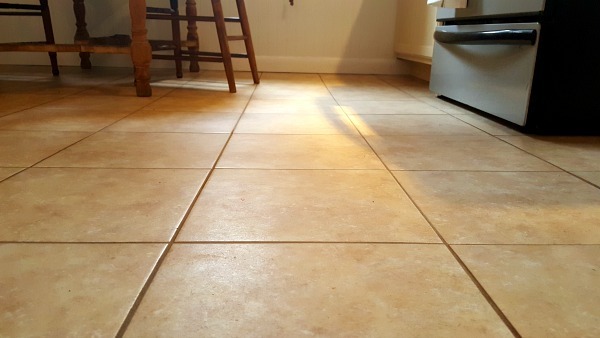 Because we moved some lower cabinets around, we had to replace the tile floor. We got the deal of the century on these ceramic tiles, just $.58 each from Lowe’s. We did end up hiring someone to install the floor after we did the demo because of how uneven the floor is and how many other projects we had going on. 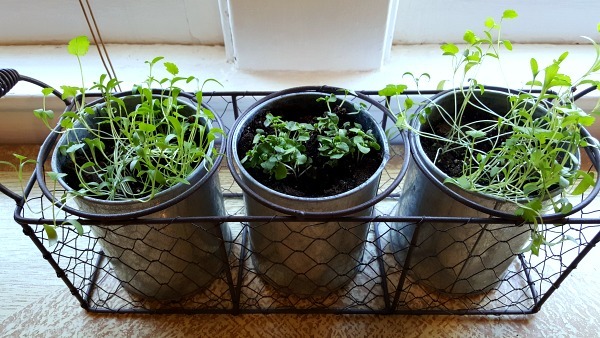 They aren’t super exciting, but they are a good choice for the room – this side of the house doesn’t get a ton of natural light and they really help brighten the room up. My kitchen is only about 10′ x 10′, so every inch of it needs to work pretty hard. Believe it or not, I’ve catered parties for 100-200 people in this kitchen – and that was before the renovation. I put a lot of thought into including clever, space saving ideas and extra storage wherever I could. 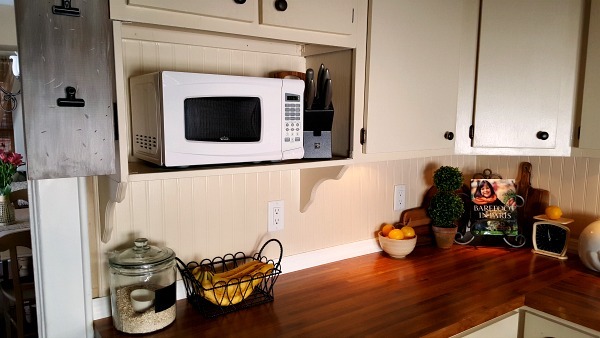 This budget kichen reno is jam-packed with clever, space saving ideas and extra storage. 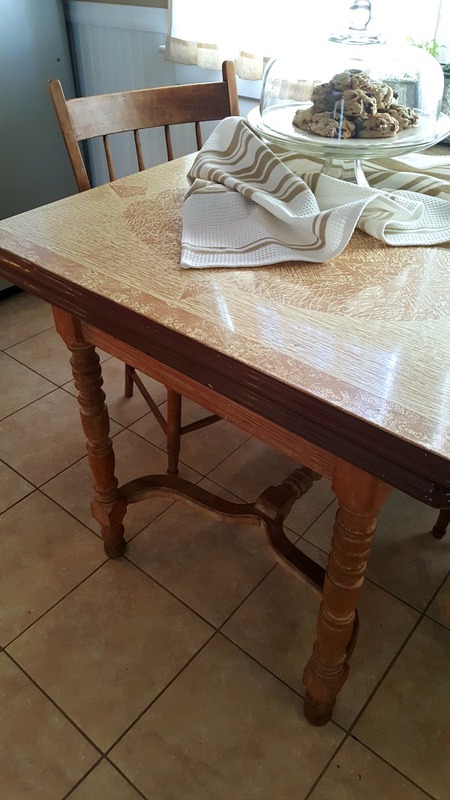 I had about 18″ of butcher block left from the counter, so we made an extendable work surface using heavy duty brackets that fold down when not in use. We added some extra wood inside the cabinet to support the weight and give the screws something to grab onto. I wasn’t wild about the way the hardware looked when we first installed this. 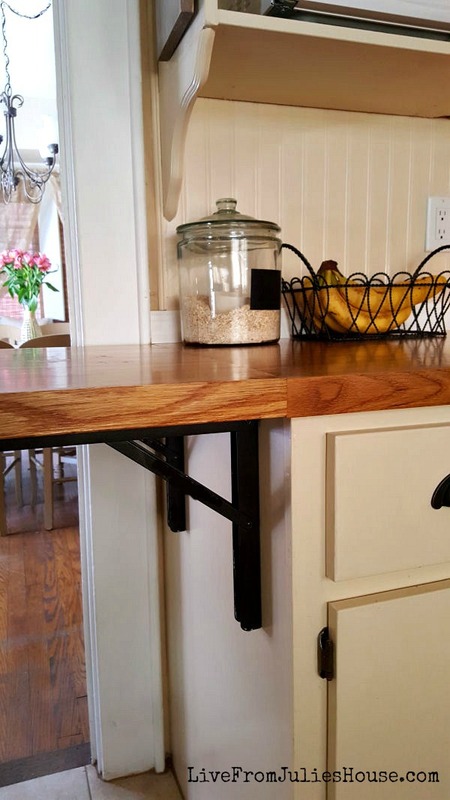 Because of the counter overhang, we had to add a shim to allow the brackets enough room to work, and I thought it looked cobbed together and unfinished when the butcher block is down – which is most of the time. 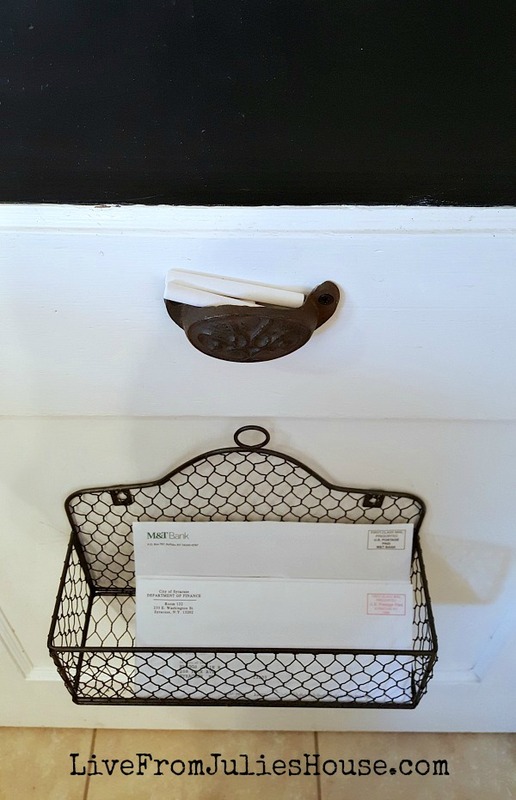 Then my mom stopped by one day and suggested that I paint the bracket and the shim oil rubbed bronze to match the rest of the hardware in the room to make it look more intentional, and that ended up being a great solution. 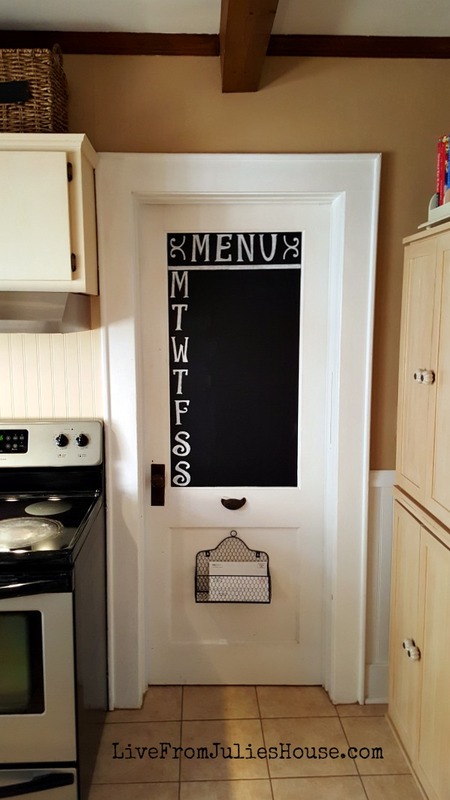 Because this extends into the doorway, I obviously wouldn’t have it up when I have company – but my prep would be done before anyone arrives anyway. It’s super-handy and I use it almost every day when I’m cooking. This whole set up is pretty life changing….I had a ton of spices and could never find what I was looking for in my inefficient corner cupboard, so I had tons of duplicates. Now that they are in alphabetical order, I’m working my way through the doubles and triples. I really struggled with what do with this area – I tried a lot of things and it all just looked like clutter to me. Finally in desperation I picked up more baskets and it was exactly the right solution. 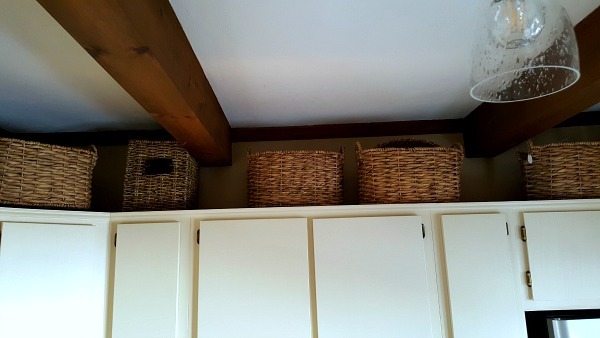 Not only do the baskets provide tons of extra storage, but having similar items up there breaks up the room a lot less than a row of random tchotchkes. That matters a lot in a room this size. 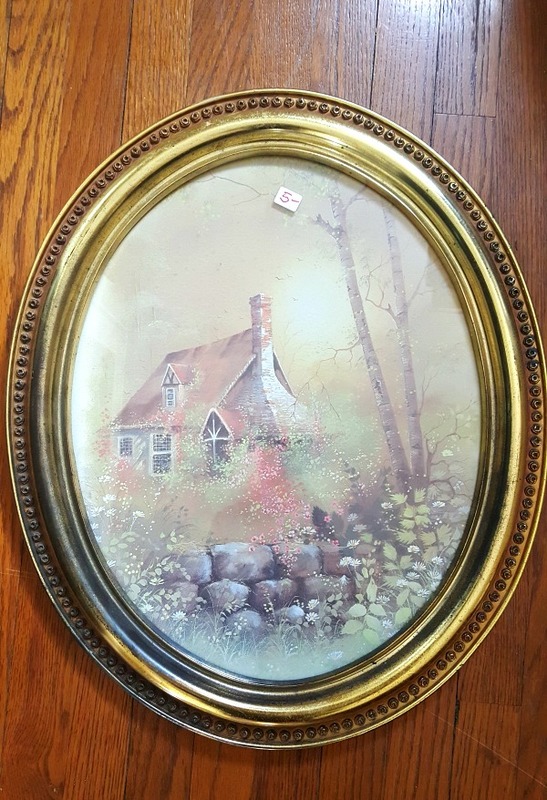 I bought this at a flea market for about $30 shortly after I bought the house and I still love it. It expands and sometimes I pull it into the middle of the kitchen and use it like an island when I’m prepping for big parties. Realistically, I should swap it out for something a little smaller, but I like it too much to get rid of it. Not to mention – a lot of “Wine & Talk Therapy”sessions have been held at this table and it would make me sad to see it go. The chairs were flea market finds too, I think they were about 5 bucks each. 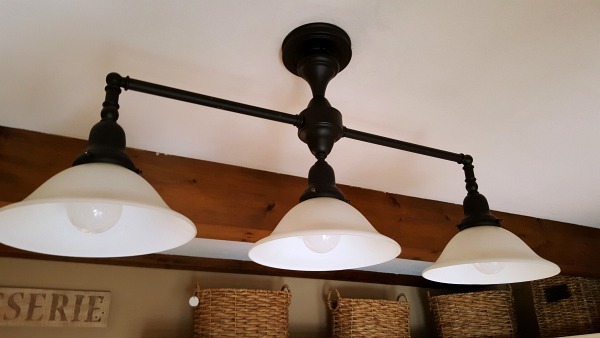 I didn’t hate the old light fixture, but I didn’t love it either. Maybe I was just sick of it? I thought it looked a little dated. I was hunting around for something else, but I just couldn’t find anything that I liked enough to drop money on. When did light fixtures start costing more than my mortgage payment???? Then I found these seeded glass light covers at Lowe’s, which are intended for bathroom fixtures. I didn’t really expect them to work out, but they were only about $4 each so I thought I would give it a shot. I put them up and I LOVE them! I swapped out my old bulbs for Edison style LEDs, and the room is a ton brighter with the clear covers. I wasn’t able to find any of the longer clear Edison bulbs locally (just the ones with the amber tint), but I have THESE on order (affilink) from Amazon and I think they’ll look even better. The Edison bulbs are expensive but $35 for an updated fixture with a whole different look is still a bargain and now it’s one of my favorite things in the room. 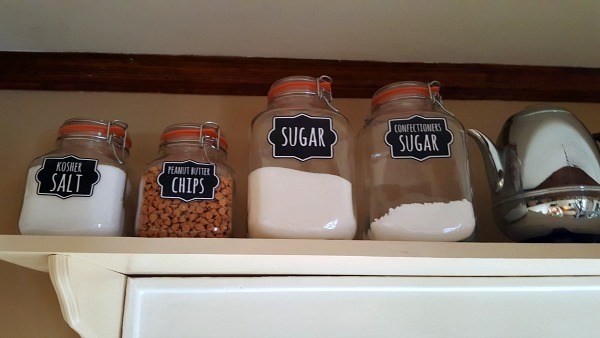 Except for the pig cookie jar. That’s my FAVORITE favorite. 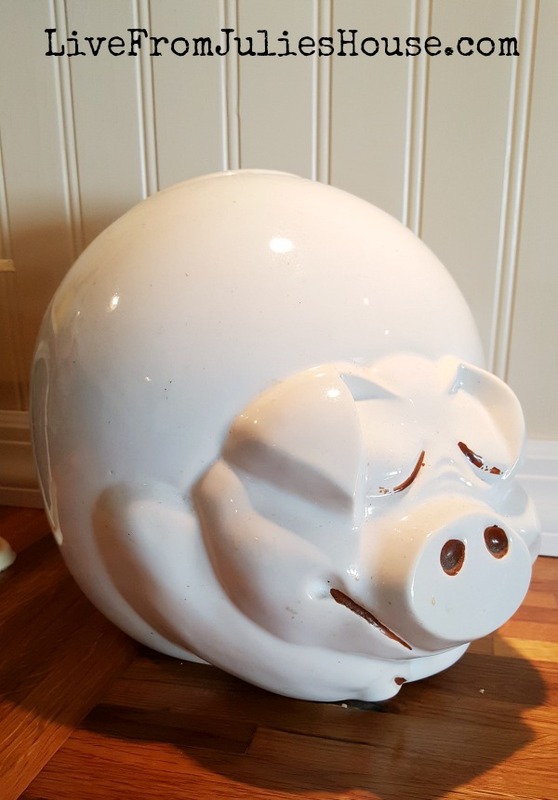 I spotted this cookie jar on a visit to the flea market with mom, but didn’t buy it because he was $30 – as much as my kitchen table!! She circled back, picked it up and surprised me for Christmas that year. 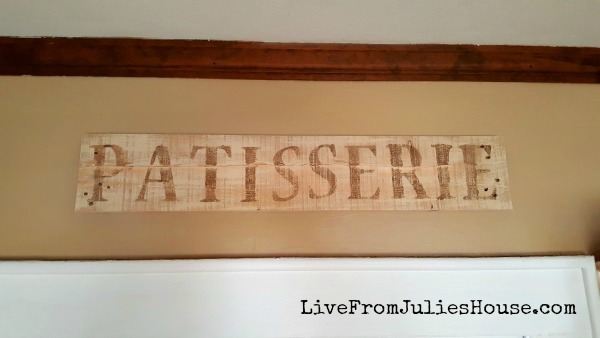 I made a vintage looking sign for above the door out of a pallet board leftover from my Giant Pallet Headboard project. I dry brushed leftover paint from the cabinets over the board, allowing the wood to show through. Then I stenciled the lettering on with some darker leftover paint and sanded it down. I planned to write “Boulangerie”, but it wouldn’t fit on the board, so I settled for “Patisserie”. It’s really not my best work – the stencils were in sheets, so they didn’t have built in spacing, which made it challenging. I’m pretending the lettering isn’t completely crooked. Let’s just call it “rustic”, okay? 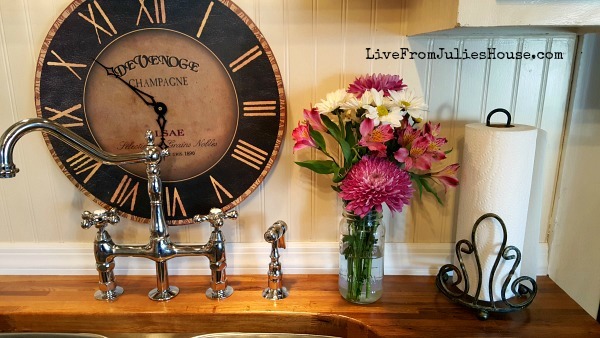 We found this gorgeous faucet from Vintage Tub & Bath and a nice, deep under mount sink from Overstock.com. 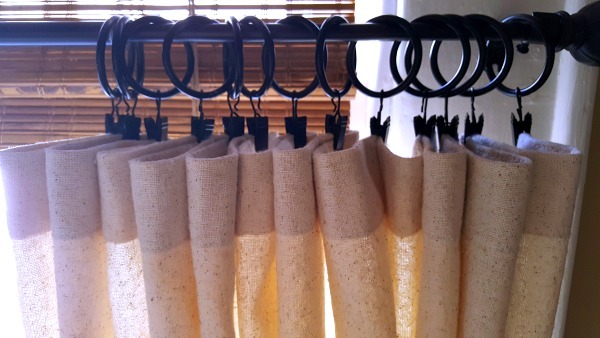 We shopped around a lot for these items and we were thrilled with the quality of both, especially for what we paid. This was somewhat more successful because the stencils were on individual cards. Should I add lines between the days of the week? I’m on the fence. I did this project in an attempt to actually remember the meals I’m buying specific ingredients for. It remains to be seen whether it will actually work. When I painted the cabinets, I removed these two doors because they had a lot of water damage from the sink. I wanted something like burlap with a nubby, natural texture, but a little more refined and easier to wash. Osnaburg is a utility fabric you can usually find near the burlap and it’s pretty inexpensive. 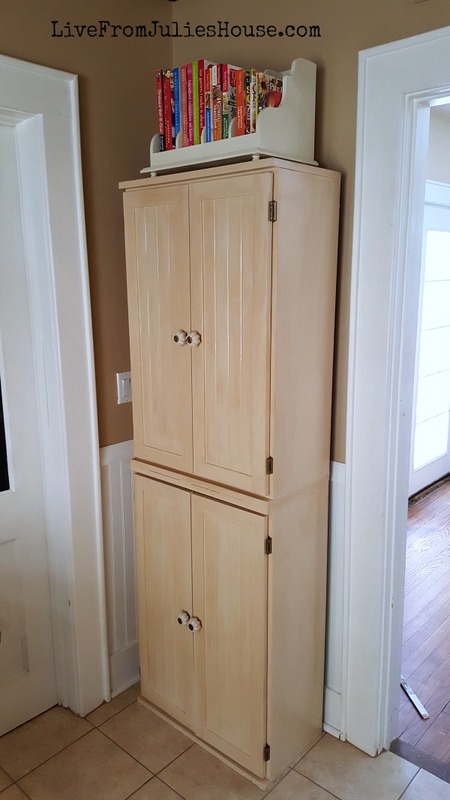 My free standing pantry cabinets got a fresh coat of paint. It’s amazing how much use I’ve gotten out these things – they began their lives as 4 black laminate cabinets that I bought over 15 years ago for an apartment I lived in briefly. They have been put to use in my businesses, my son’s room and my guest bedroom and now I’ve got 2 stacked here in the kitchen and 2 upstairs in the hallway functioning as an extra linen closet. OOPS! Is that a random paint stick hanging out on the floor in the dining room? Not an awesome piece of furniture by any means, but really, really useful. Because I don’t want the skirt under the kitchen sink getting any dirtier than it needs to be, I stash my trash can in here, among other things. 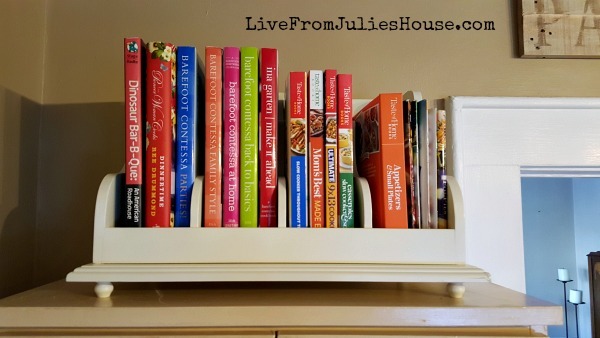 I purged all the cookbooks I don’t use and corralled the ones I want to keep in a cookbook rack I had stored in my attic. The cookbook rack got a fresh coat of paint too. It was bright white and it stuck out like a sore thumb, so I hit it with some softer Heirloom White spray paint. Anything that hangs around my house long enough will likely get painted….probably more than once. The project came in around $2500, though the expense was divided up between 2012 and 2015-16. We likely added $5,000-$10,000 to the value of the house by replacing an inefficient eyesore with updated, functional bright kitchen. I have to admit that I struggled a little with this room. As a blogger I see tons of gorgeous kitchen renovations online, and right now they all seem to feature open concept farmhouse style kitchens with white cabinets in big suburban homes. They really do look fabulous, and I considered going in that direction for a while. But, this is a tiny kitchen in a old urban home and that look just didn’t seem to jive with the personality of the house. In the end, I’m glad I did my own thing – the warm cottage style I ended up with flows perfectly with the rest of the house and suits my personal taste. White cabinets would have made no sense in relation to rest of my home and I couldn’t take down a wall without relocating a lot of duct work. It’s never a bad thing to take inspiration from other decorators, but at a certain point you need to shut all that out and listen to your own instincts. Take inspiration from other decorators, but always listen to your own instincts. Successful DIY is sometimes all about compromise, the ability to pivot and recovering from project failures (without melting down). There were a few things that I really, REALLY wanted to include in this room that I just couldn’t make happen. I wanted a few open kitchen cabinets, so I painted the insides of the 4 cabinets above the sink and removed the doors. I arranged the dishes so they looked pretty. But…the end result was not so great. I have stuff in the space above the cabinets and the stuff that’s on the counter and having the cabinets open too made it look like a hoarder lives here. So the doors went back on. I think if my cabinets went to the ceiling it would have been fine, but they don’t so I scrapped the idea. I was originally planning on opening up a large pass through between the kitchen and the dining room, but discovered that the main duct work that delivers heat upstairs is in that wall. I have a little collection of vintage small appliances – a toaster, coffee percolator, counter top mixer and bread box. 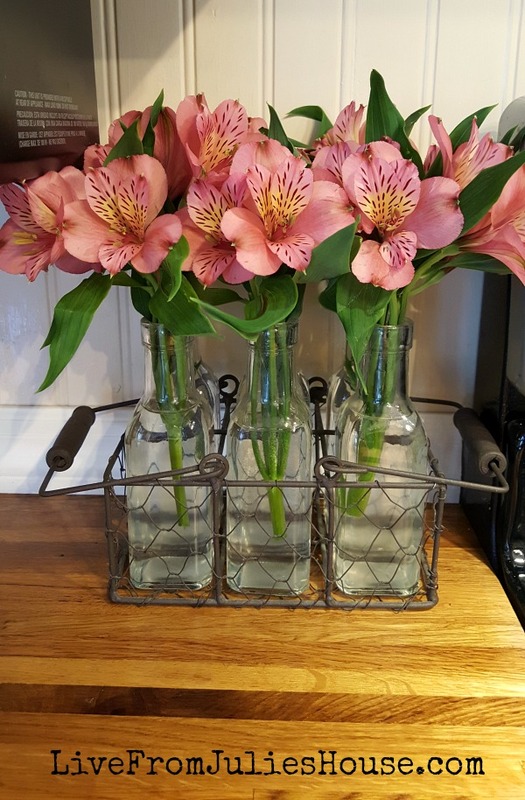 I really like them and would love to display them in the kitchen, but I ended up preferring the more streamlined look of the baskets above the cabinets – so the coffee percolator is on the new open shelf above the windows and everything else has been packed away in the attic. 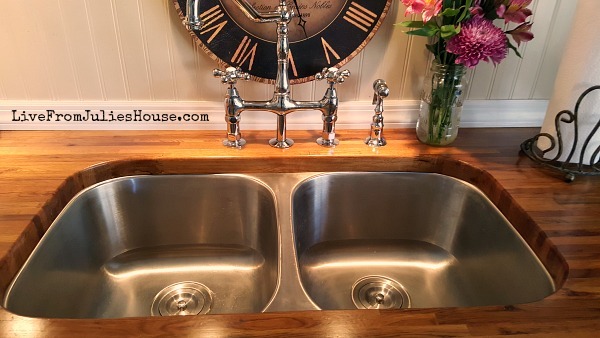 I was originally planning on a farmhouse sink, but I added so many other projects that I just couldn’t justify the expense. Aside from that, my old cabinets would have required a lot of retrofitting to accommodate the weight. 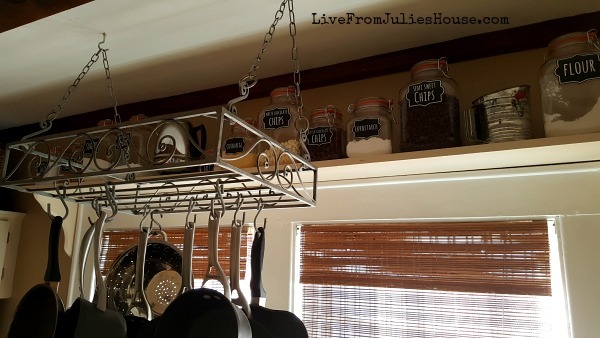 I am thinking about spray painting the hanging pot rack. Do you think it would look better in oil rubbed bronze? I don’t love the finish on the DIY Recipe Holder. I’m on the hunt for a cutting board the right size to replace it with. I have been lusting after a double oven for years. They are pricey, so we are on the hunt for a good deal. We have not located one yet, so this item is still hanging out there on the To Do list. 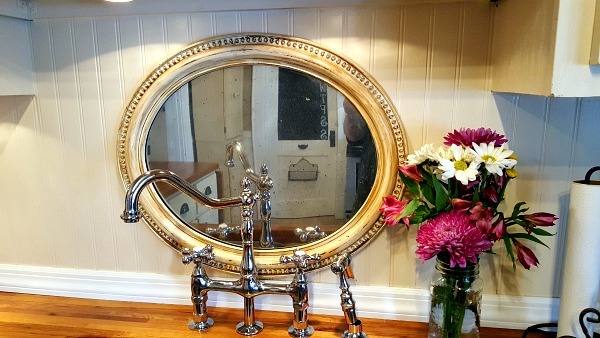 I want something cool to hang on the wall over the sink and my friend Lisa suggested a mirror. I have looked high and low for a horizontal, crusty vintage mirror or a new mirror that I could make vintage with no luck. It’s going to be one of those things that I stumble on when I least expect it. In the meantime, I stuck a large clock in that spot. I thought I would try the “faux mercury glass” technique I used on my lamps HERE, but as you can see….it was a kind of a disaster. It ended up looking like a cheap dirty mirror that hadn’t been dusted in like, 20 years. At least the guy at the junk shop threw in the vintage flour sifter I have on the shelf above the windows for free. 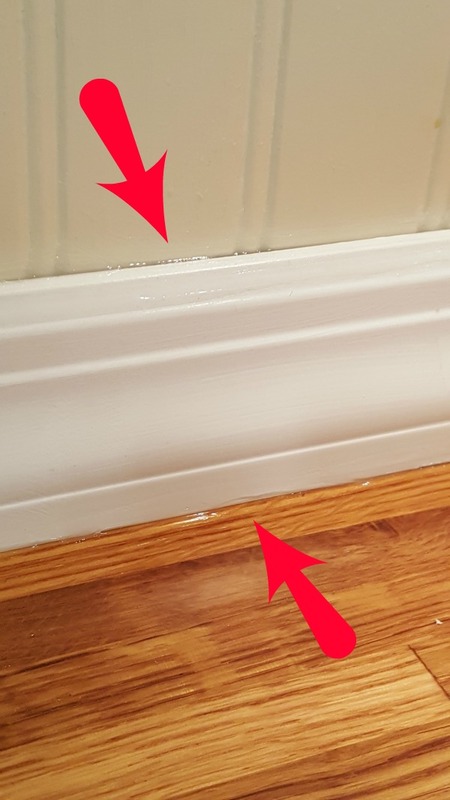 In a fit of productivity, I caulked the living sh*t out of the kitchen one night and made the brilliant decision to using non-paintable silicone caulk on the trim above the counter. It set me back a full day of progress, and you can get all the dirty details of this proud DIY moment HERE. I used this color palette from Lowe’s through the entire house. 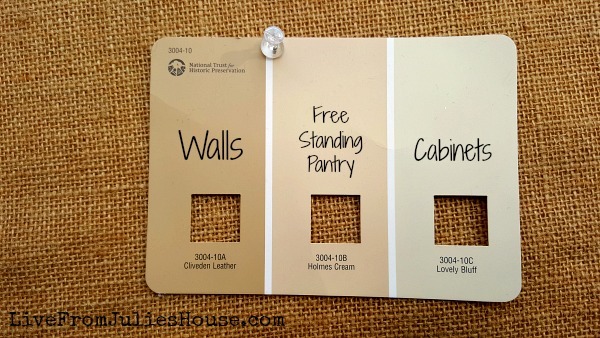 Yep, every room is one of these three colors and I can’t even tell you how easy it makes my life.